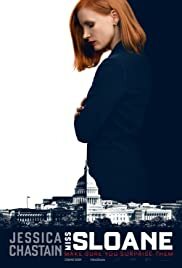 Given that this film deals with gun control legislation and lobbying, one might think Miss Sloane is ripe for controversy. But looking at it’s dismal box office results, you’d probably be hard-pressed to find anyone who has even seen the film, which is a shame because it is a gripping film full of intrigue and suspense. It’s also curious, because while Elizabeth Sloane (Jessica Chastain) lobbies politicians for a gun control bill named Heaton-Harris, and you have lobbyists supporting the opposing side, I think the true focus and real appeal of the film isn’t about any of that. With a main theme of gun control and lobbyists, you would be forgiven for thinking of this film as a political movie, but it really isn’t. It’s a thriller, first-and-foremost, and a character drama second. The guns and the lobbying are there merely as a plot device, a polarizing way to attract and audience (and perhaps the reason it never found one). The real draw is the thriller aspects. It’s a cross between drama and mystery, a film that keeps you on your toes with twists and turns, not only to surprise you, but because that’s how Elizabeth Slone operates. Miss Sloane takes its direction 100% from its title character. All eyes are on Jessica Chastain’s character and she pulls it off with a tour-de-force performance. Sloane works 16 hour days and is on the brink of death due to exhaustion (and is on medication for it). Chastain surely embodies this and looks like she’s been through hell and back, as if she was pulling 16 hour days during shoots. She also has a particular set of skills so to speak, that makes her character arc one of downfall and redemption simultaneously. She uses questionable methods to questionable ends and displays the emotions of a Vulcan. There are parts we like, parts we hate, and parts we absolutely despise about Sloane, but in the end you feel like the result is the one you wanted all along. Was the journey to get there all worth it and/or would you take that path yourself if you could guarantee a victory? I don’t know the answers and neither really does Sloane. This is not a film you sit down, relax, and turn your brain off for. Miss Sloane demands dedication and earns it throughout the course of the film. Writing and performances are outstanding all around, and the direction by John Madden (no, not that one, the one who directed Shakespeare in Love) leaves you at the edge of your seat for large portions of the film. One sequence in particular stands out as truly surprising, and surprising for several different reasons, and the significance of each is revealed incrementally over the subsequent few scenes – each revelation bringing a “What!?! ?” moment.